Erica Kurc, PT/DPT/Manager, along with several of her staff members, Marissa Jack, Rachel Buriani and Matthew Kelly, have chosen to be apart of Unbroken Warriors’ fundraising in a big way this holiday season! 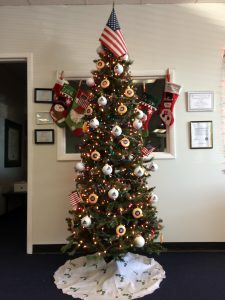 They have an Unbroken Warriors Holiday Tree in their reception room for clients and staff to purchase ornaments so all profits can be given back to UW! Ms. Kurc and her staff have also spread the word through other NovaCare Rehabs in the state. It’s humbling to see so many health care professionals care as deeply about this cause as we do! Please support businesses that pay forward their success and are willing to collaborate in further military and veteran charities! If you stop in, you may even catch Erica, Marissa, Rachel, and Matthew in Unbroken Warrior t-shirts to promote their involvement with our organization! Check them out on Facebook @NovaCareRehabilitation for more information about their practice and purchasing ornaments! Thanks for all you are doing NovaCare Bayville! !